Just got off the phone with my Fuente rep minutes ago. 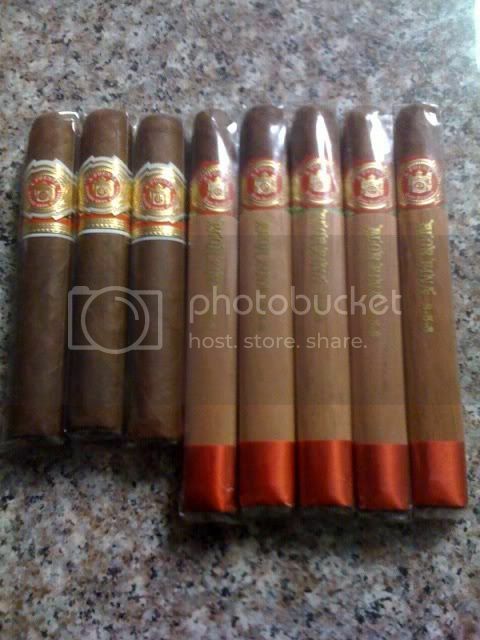 Fuente is going to release 3 new sizes with Rosado wrapper in the next few weeks. Retail $6.75-$7.75. 52, 54, 56 rings. Varying lengths between 5 and 6.5 inches. For all of you 858 Rosado lovers, it looks like your time has come. Any more info? Like how they will be distributed and will they be limited releases (if so, how limited), seasonal releases or standard production? By your comments, I take it that this is the same wrapper as the old 858 Rosados? Sorry, but I don't have any additional info. My rep said they have not even seen the sales sheet. All he was told was the sizes and the wrapper. They will be shipped in Dec and then be available again as regular production cigars after the 1st of the year is what I was told. I'd be interested in hearing more info as it becomes available. Are these suppose to be the Angelitos? I don't know what Angelitos are. There will also be a VERY small allocation of 858 Rosado as well. Watch for them at the longer-standing Fuente accounts in your area. Is this the same wrapper Fuente lists as "Sun Grown" or is this something else? Do you have a list going for the Rosados? Let's get some pics up, I know they are out and available now. The 858 Rosado is not the same one as listed on here... it is an 858 Sungrown Rosado wrapper... so it has a green band and the red ribbon with the cedar. Saw them at my B&M... picked one up to show a pic... will post it later tonight when I get home. Thanks Zach, I've seen those before but I was referring to the new ones. Oh well... I'm sure I'll see it soon. Thanks again bud! I'm lovin' the cool bands on the Rosados. Thanks for the heads up. I'll keep an eye out for these! The 858's are Sun-Grown Rosado wrapped . Not to be confused with the original 858 SG's with the black satin band on the foot of the cedar sleeve . They look great, will keep an eye out for them! Had one of the Rosado's last night. It was fresh from the shop. I liked it a lot, but then I love Fuente cigars, but I do think these will be a lot better after resting in a humidor for a while. To me it was a more complex flavorful Chateau Fuente sungrown.